In a cozy room filled with windows, books and cheerful posters, two kindergartners practice letter sounds by playing a picture game on a carpet mat. A few doors down, third-graders sit in rapt attention – hands rising rapidly to answer questions – while their teacher talks about the primary colors in famous abstract art. Another door opens to a science lesson where children happily bang rocks together to make sand as the classroom snake naps in its glass case. At lunchtime, the children head to a cafeteria offering baked chicken, fresh salads, apple slices, beans and rice. The Renaissance West STEAM Academy gleams in its newness, and students know their teachers expect great things from them. The new public school, loaded with extra resources from donations, is key to the Renaissance West Community Initiative, an ambitious effort to lift families out of poverty and into better lives. It’s located in what was once one of Charlotte, N.C.’s most troubled neighborhoods, the former Boulevard Homes housing development on West Boulevard. RWCI’s holistic cradle-to-career approach attacks the factors that can keep families poor, from lack of education, skills, child care, affordable housing and transportation to crime, mental health and substance abuse issues. A variety of agencies, including housing, social services and medical, as well as nonprofits and business leaders have footprints planted firmly in the effort. The $90 million revitalization plan started with the demolition of the decaying Boulevard Homes public housing project, a community gripped by poverty and crime. The Renaissance, an attractive, modern brick apartment and townhome complex with 334 units of mixed-income housing, replaced the old buildings. Some tenants pay the market rent rate of $1,000 a month. Others, who qualify for public assistance, pay what they can afford. Subsidies come with stipulations: Tenants must work, go to school or be in training for at least 30 hours a week to live there, said Amanda Golmont, development officer for RWCI. Another portion of the complex contains 110 apartments and a senior center. Across the street and on the other end of life, the newly opened Howard Levine Child Development Center provides early education to give children a strong foundation for school. A community center offers job training, GED classes, personal finance counseling, computer literacy courses and other opportunities for adults. The STEAM academy opened in August 2017 and is the home school for about 450 children from The Renaissance and other neighborhoods. About 90 percent of them started the school year academically behind. It’s a pre-kindergarten through fifth-grade school for this first year. The middle school wing will open in August 2018 when this year’s fifth-graders transition to sixth grade. 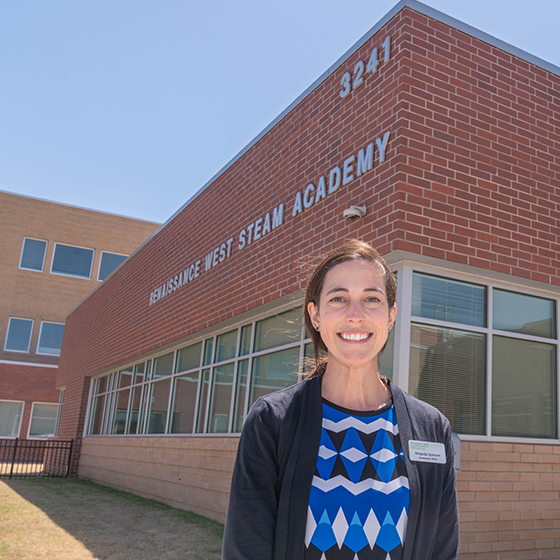 They’ll stay at the STEAM academy through eighth grade, with the total enrollment expected to grow to about 1,000 students. The carefully chosen staff includes young and veteran teachers committed to working with disadvantaged children. Danielle Rutter, a fourth-year teacher, incorporates learning games as she works with one or two children at a time in the school’s literacy center. Throughout the building, other teachers echo hope for their students’ success and talk about the strategies they use to help them achieve. 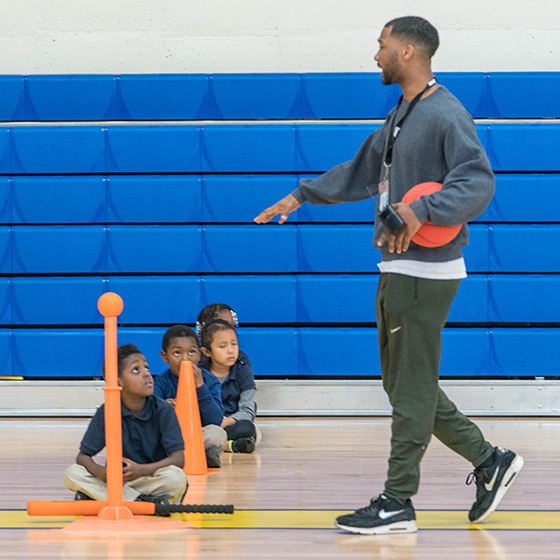 In the sparkling new gymnasium, “Coach” Clay Sanders incorporates a character lesson into each gym class he teaches.Sanders, 35, worked in banking and insurance before deciding he had a greater calling – teaching. He also runs an after-school sports program two days a week. May is Duke Energy In Action Month, when employees throughout the company’s six-state service territory volunteer their time for dozens of causes. Community service and employee volunteerism are central parts of the company’s mission. Employees and retirees in 2017 volunteered 109,000 hours of service. 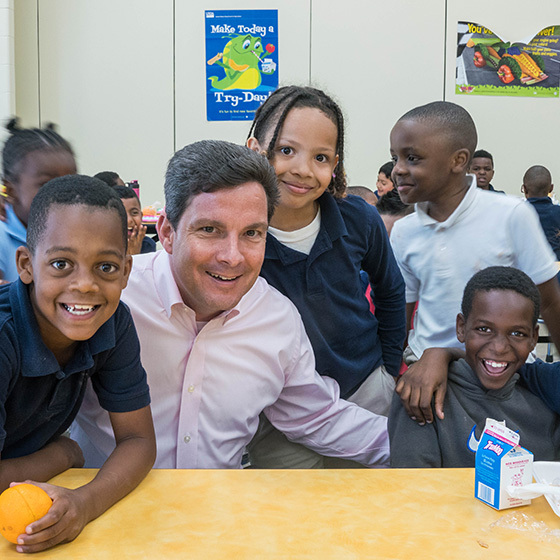 The Duke Energy Foundation focuses its giving on education programs and initiatives that span the kindergarten-to-career spectrum, with an emphasis on science, technology, engineering and math (STEM) skills, childhood reading proficiency and workforce development. 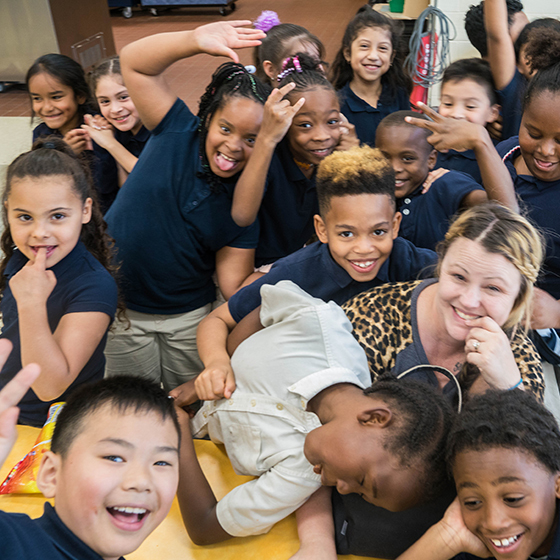 On May 18 at Renaissance West, Duke Energy volunteers will serve as breakfast buddies and work in a variety of projects at the school and the child development center.